The view from the nosebleed section. Sorry you can’t see the artists. I blame my camera. It’s getting close to Valentine’s Day, and Shelly and I decided to celebrate early by going to a concert at American Airlines Center in Dallas last night. The performers were Sting of “Roxanne” fame, and Paul Simon of Simon & Garfunkel fame. 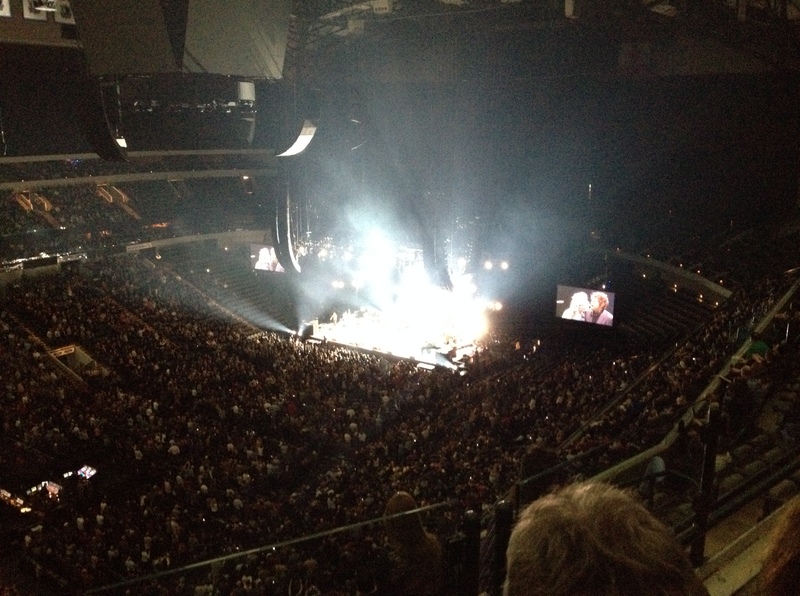 It was a great concert–for the most part–even though we had to pay quite a bit just to sit in the nosebleed section. What dampened it for me were two couples who sat right behind us. When the first song began, I had a hard time hearing the concert because the couples continued to talk full volume while the artists performed. More than once I turned and gave them a dirty look, which shut them up for a while, but then they started back up. This went on for 45 minutes. Finally, I guess they took the hint and got up and moved down the row so they weren’t sitting immediately behind me. But it boggled my mind for someone to pay over $100 for tickets and then sit and talk all during the concert. And finally it made me think how often we miss what’s going on right in front of us because we are already moving on mentally. It reminds me of when Matt, my 35-year-old son, was just a baby. We went through the usual steps of looking forward to him sitting up, then crawling, then walking and talking. After a while, I realized that wherever he was in his development, he would never be there again. So, based on that reality check, I vowed to try and focus on what is happening to me right here and now. As I get closer to retirement–and what happens after it–I find myself doing the same thing. I could be looking forward, but if I fall into that trap, I am likely to miss what’s in front of me. We only go around once in life–unless you have a trick that I am not familiar with. And so it’s important that we slow down and enjoy the ride. The concert was a great treat. We agreed that we don’t take enough time to do such things, and Shelly and I decided that we will try to hit more concerts in months and years to come. Those who lost sight of today because they are looking forward to some great reward are missing an important truth: life itself is the greatest reward of all.